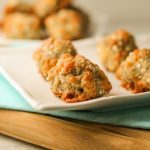 A perfect grab and go snack, breakfast, or appetizer, these Paleo sausage cheese balls are a handy bite to eat warm or cold! We love how easy they are to make, and how portable they are for any occasion or trip. They would even make a great hiking food! Years ago before children, I was a teacher. We had epic staff room spreads, and the holidays were always a time when everyone would bring something in to share. One year, there was several items that I enjoyed SO much, I begged for the recipes! This is one of those recipes, well loved and tattered languishing away within my recipe book. After almost 8 years of cooking allergy free, recreating the gluten filled recipes of my past has become much easier. While some tinkering is necessary, knowing these ingredients well makes it much easier for me to make substitutions with success. This recipe is unique in that it uses the sausage to bind…and requires minimal flour. It seems like it shouldn’t work…but it does!! And every single bite is loaded with sausage and cheese flavor…pretty amazing! I also love how portable these are! While we never intended them to be travel food, we found that we loved grabbing leftovers for a quick, high protein snack!! It was kind of by accident…but now these are on the camping and hiking list of perfect nutrient dense, portable foods! I like to use this cassava flour in so many recipes because it is SO versatile and has a neutral flavor! And unlike tapioca starch which is JUST the starch, cassava contains the whole root and contains lots of digestive-resistant starch which feeds the healthy gut flora! Great for digestion! When baking, it is ideal to keep the items uniform in size so they all cook evenly. This is why I love to use my cookie/food scoops to keep it consistent! I use my different sizes for cookies, muffins, meatballs, and these biscuits! 3 cups sharp cheddar cheese grated, I have done this with Daiya Shreds too!! Preheat oven to 400 degrees ad line a cookie sheet with a non-stick baking mat. In the bowl of a mixer, slowly beat all ingredients until everything is incorporated and well mixed. 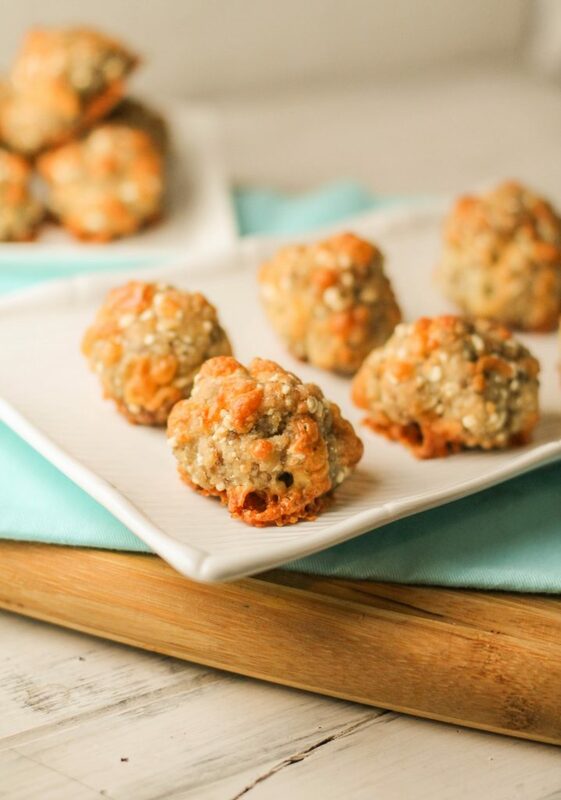 Using a cookie scoop or your hands, roll about 2 tablespoons dough into a ball and place on a lined cookie sheet. They will not puff or move much, so they can be close to one another! Bake in a preheated oven for 15-20 minutes until just golden and set. These look awesome, so perfect for grab and go kind of snacks, and I love that they’re perfect for meal prep too! I made these with a few adjustments for allergies/sensitivities, and they turned out great! I substituted garbanzo bean flour (chickpea flour) for the almond flour and Daiya shreds for the cheddar cheese, and it worked fine. I went with garbanzo bean flour because it has a neutral taste and is just as high in protein as almond flour. Thank you Tessa for the fantastic recipe! Yum, they look great! Has anyone tried with a sub for the almond flour (peanut/treenut allergies here)? Fantastic ideas for our hiking adventures with kids. They are so messy if I don’t have right snacks for them! Perfect recipe ! 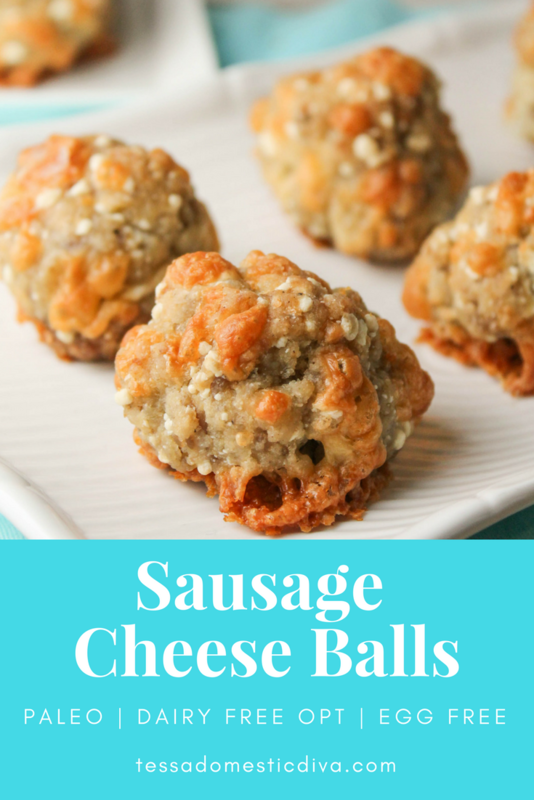 These sausage cheese balls look like an excellent app for our next party. I love that they are healthier, but no one will ever know or care because they are delicious! Pinning to try soon! Yum, you had me at baked cheese 🙂 I can definitely see why you guys would be grabbing these for a quick snack, they’re perfect! Sounds so yummy! Do you think I can sub out the cassava with something low carb? Definitely Yvonne. I was going to test it out using part collagen and with more almond or a couple tablespoons coconut. What a simple, delicious-looking recipe! I’m pinning this to try. It looks like a great thing to take to parties. I love how easy these are to make. I’d serve these as little appetizers when I have guests they’d go down a treat! I bet my kids would looooove these! 🙂 They sound delicious! I bet these are fantastic and perfect for parties!! They look delicious! Oh man, my kids would definitely eat these up! Great idea! These look soooo good! Cassava flour is so versatile! 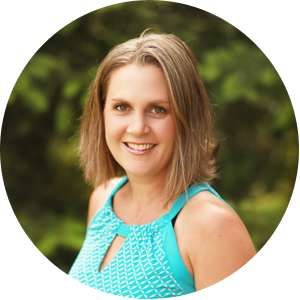 linda spiker recently posted…Paleo-Whole 30-Keto Huevos Rancheros! Perfect breakfast flavors in one bite! So perfect for on the go and I bet kids would love them as well. Woah, only 5 ingredients? I am in! I always smile big on the inside when we go to a party that has sausage balls. They’re so freaking good! 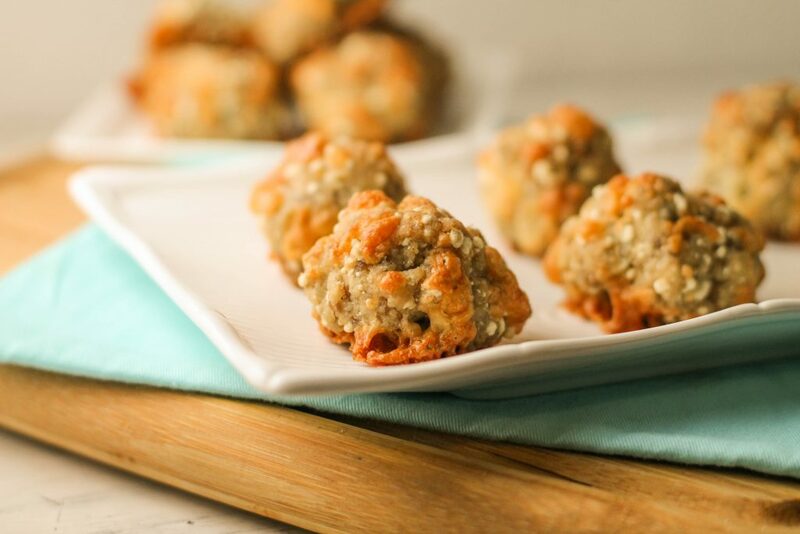 I’m in love with this grain-free recipe! This is a brilliant idea. Cheese balls are very handy. I think this would make wonderful packed lunch. So excited to try this since I believe the kids would love this. Kid pleaser for sure Shelia!! This looks so easy and would be great for our meat loving visitors!